Warning! Programming might not make you rich. 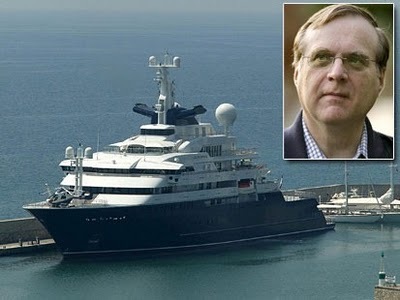 On a completely different topic, here’s Paul Allen’s private yacht, “Octopus”. (He’s a programmer). So you want to learn to code? Well this is the right place. I assume no prior knowledge, except knowing how to turn on a computer, open a text editor such as Notepad, and have some idea of the operation of a keyboard. It may not be immediately obvious WHY I’m covering some of the topics in this article, but rest assured that, like Daniel-san painting fences or waxing Myagi’s car, it is all about preparing your state of mind. Actually, while we’re on the subject of films, before you begin, make sure you watch The Social Network and The Pirates of Silicon Valley. They’re essential viewing for wannabe programmers! WAIT! Stop! Don’t be afraid, we’re only going to touch the absolute basics. Primary school stuff. Nothing else. That’s all you need! Really? I hear you ask. Yes!! You don’t need to be a maths whiz to be a great programmer. Leave all that business to the computer!! …you’ve written a “program”. A program is simply a set of “instructions” for the computer to perform. Even if it’s just 1 + 1! Sure, most programs are a lot more complicated than adding 1 to 1, but at its most basic, that’s it. Easy!